Niall Horan has a night out on the town! 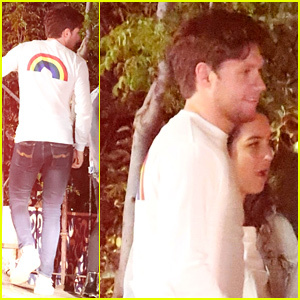 The 25-year-old “Slow Hands” singer was spotted out and about with a group of friends on Thursday (April 4) in Los Feliz, Calif.
Niall stood on the sidewalk as he chatted with his pals. He wore a long-sleeve white shirt with a rainbow on the back of it, along with a pair of fitted blue jeans.